Cricket - AKA Miss Cricka AKA The Cricka-Monster...Full Name: Cricket Chaka Khan Bliss. Cricket is the 'newest' of our family. We adopted her the summer of 2015 when she was just under 2 years old. She's all of about 6 or 7 pounds but don't let that fool you! She's been a leader since she entered our lives and always puts a smile on our faces! 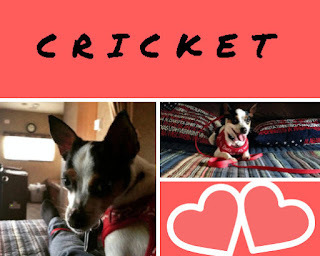 Cricket is a Chihuahua and Rat Terrier Mix. Some may refer to the mixed breed as a RatChi or RatCha. She lets Riley lick her face and ears. Outside of our home, her BFF is Lexi (my parents' dog). She enjoys car rides and visiting a local nursing home a few times a year. Riley - AKA Rye AKA Rye-Dog AKA The Smaug...Full Name: Riley Bliss. When we adopted Riley he had separation anxiety. 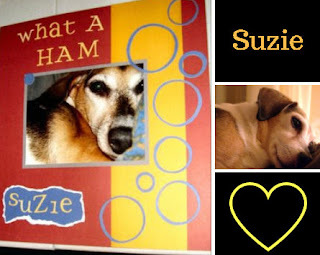 He adored Suzie and wanted to BE Sammy. Now in his upper teen's, he STILL craves attention and wants to be near you. Riley has a VERY unique shade of red on the top of his body fading into a brown on his mid-leg and white feet and underside. He's half Corgi and half Lab. Basically a Corgi body with a Lab head. He's not fond of men other than DH and my BIL. That makes him a 'Ladies Man' with humans and most other dogs, too. He likes both his brothers and sisters but would often lick Cricket and Suzie's ears. He has quite the pout and pathetic look when he's bummed out. 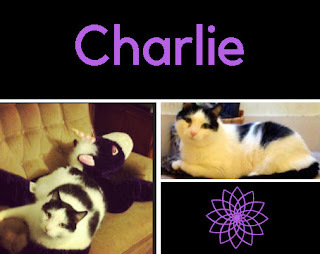 Charlie - AKA Bugger AKA Charlie Chuck-ums AKA Bug-E-Fresh...Full Name: Charlie Bug Bliss. Charlie is getting up there in age. We rescued him from a terrible situation when he was just a kitten and that was in 2001 even before DH and I were engaged. He's a feral cat but has been an indoor cat ever since we have brought him home. He had breathing issues when we first got him and about a year after that, he had 'crystals' and urinary issues but those are thankfully in the past. Several years ago Charlie had an open wound on his tail that wouldn't close and it had to be removed - leaving him a nub instead of a tail. He's like a grumpy old man and he currently deaf. He's NOT a cuddler and still has feral tendencies but once we realized that all seemed to be well. 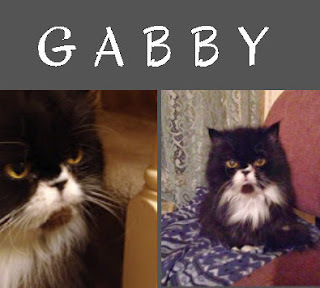 His buddy was Gabby. Gabby - AKA Gabby-Scabbers AKA Gabriena AKA Gabber-Goo AKA Snoop-Gabby-G...Full Name: Gabby Bliss. Gabby was the sweetest little girl ever! She was a Persian Cat that we adopted and full in love with from the start. We lost her to cancer in 2014. She was never very big only between 7 and 8 pounds on the average. Despite being polar opposites she was buddies with Charlie. She was hard to photograph. She had the cutest little squeak-meow. Her vet said that she was one of the few cats to give him kisses each and every time she visited. She was a true angel and we miss her very much. Suzie - AKA "Q" AKA Q-Bert AKA Sue-Bert AKA Sue-Bee...Full Name: Suzie-Q Bliss. We adopted Suzie about a year after we adopted Sammy and they were Best-Buds there-after. She was and always will be 'The Queen Bee". She was a sweetie, a protector, a leader, and force! Riley idolized her. She was part Dachshund and part Jack Russell. She loved getting her picture taken. Our house was a lot quieter after she passed. We lost her to cancer in 2014. I see a lot of her in Cricket. I wish the 2 of them were able to meet but she was taken from us too soon. She will always have a special place in our hearts and lives. Sammy - AKA Sam AKA Sampson AKA Bootros Bootros...Full Name: Sammy Bliss. I love ALL of our furkids the same. I don't play favorites. 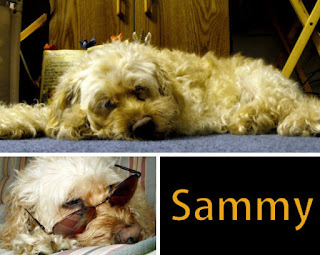 But there was something about Sammy...he was like my soulmate! We adopted him right around the time DH and I got married in 2002 and he was about 10 years at the time we adopted him. He was a snuggler. He wouldn't ever be too far away from me. He loved it when I brushed him. He loved riding in the car and camping. He loved kids, elderly, and everyone in between. He was a Cockapoo. His buddy was Suzie. 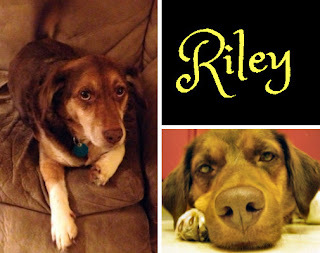 He tolerated Riley. 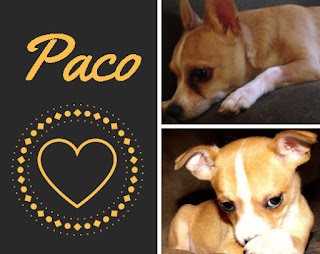 I often wonder what he would have thought about Paco and Cricket. We lost him to some form of cancer or brain tumor in 2009. I still think about him every day!